Who thought there was a Singer Knitting Machine. When I hear the word singer, I always think of a sewing machine. Singer makes great sewing machines, but it was interesting what I could find out about their knitting machines. 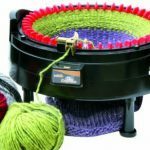 Because I love knitting, and even knitting with a machine, I thought that I would see if there were some other types of knitting machines available out there that were cheaper to try than the addi Knitting Machine. Although the addi is in a class of its own, there are a lot of cheaper options out there for beginner knitters to try. The Singer Knitting Machine is a reasonable alternative to get going on and it won’t break the bank. 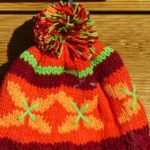 The kids will enjoy the Singer Knitting Machine too, as it is super simple to crank out some trendy scarves, socks, and hats. Make sure you supervise the kids, as this machine isn’t as strong at the more expensive options, and the plastic will crack with rough handling. This singer knitting machine is just perfect for beginners and also children from the age of about seven can also use with ease. It has 22 needles and is ideal for knitting cool fashion accessories like hats, socks, scarves and leg warmers. This neat little package contains one knitting machine two skeins of yarn one knitting hook one knitting needle and instructions. The legs are a couple of inches tall so that the project can feed easily under the machine. This type of machine is made for circular knitting, and straight knitting will need to be taken a bit slower, or you will have many dropped stitches. It is recommended for ages 8 and up, as there is a choking hazard warning. Definitely not for children under the age of 3 years, as they can choke on the small parts. Tip: This machine works better if you work slowly, and is not as advanced at the addi Express Knitting Machine, but is a good buy for the price, and you can still make scarves and hats in a very short space of time. If you would like to find out more about this Singer Knitting Machine, simply click on the link above or on the picture. This machine is a few dollars cheaper than the above machine is aimed at kids. This Singer Knitting Machine includes the machine, yarn, needle and a booklet. It measures 8 x 10 x 4 inch and is ideal for making small fashion items in both round and flat stitch. The tube size is about the size of a child’s leg warmer. Tip: If you are looking for a cheaper knitting machine, I would rather go for the NKOK above, as reading all the reviews on this one, there was more bad than good. Ultimately you will want to work yourself up to either one of the addi Knitting Machines or the Caron The Ultimate Sweater Machine if you are at all in the marketplace for a decent knitting machine. Here is an informative knitting video about the Singer Knitting Machine you may enjoy watching.